Preheat the oven to 400°F. Place the wings in a bowl and toss them with the oil and several big pinches of salt. Arrange the wings on two baking sheets lined with parchment paper or foil. You don’t want them to touch. 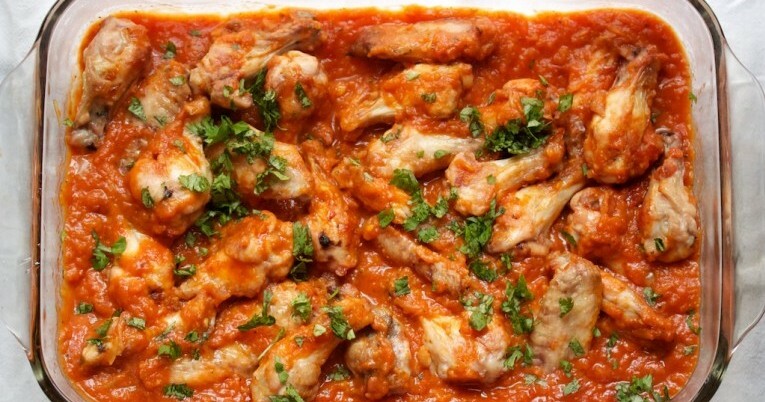 Bake the wings for 15 minutes, then increase the oven temperature to 425°F and bake for 15 more minutes. The skin should be brown and crisp. Meanwhile, heat a Dutch oven or large saucepan over medium heat. Sauté the onions until translucent and soft, about 8-10 minutes, stirring frequently. Add the garlic and the ginger and cook for an additional 3 minutes. Carefully pour in the tomatoes, then add the salt, sugar, spices, and 2 tablespoons of the vinegar. Bring to a boil, then reduce the heat to low and let the chutney simmer for 15 minutes, stirring occasionally. Add the remaining vinegar. Let the chutney cool til a splatter wouldn’t burn you (about 15 minutes), then purée in a food processor or using an immersion blender until smooth. Place about three quarters of the chutney in a serving platter with sides. Using tongs, transfer the wings into the sauce. Toss all together to coat the chicken with the chutney. Garnish with cilantro. Serve hot or at room temperature. You’ll have some extra sauce—you can put it out with the chicken or save it for another use.